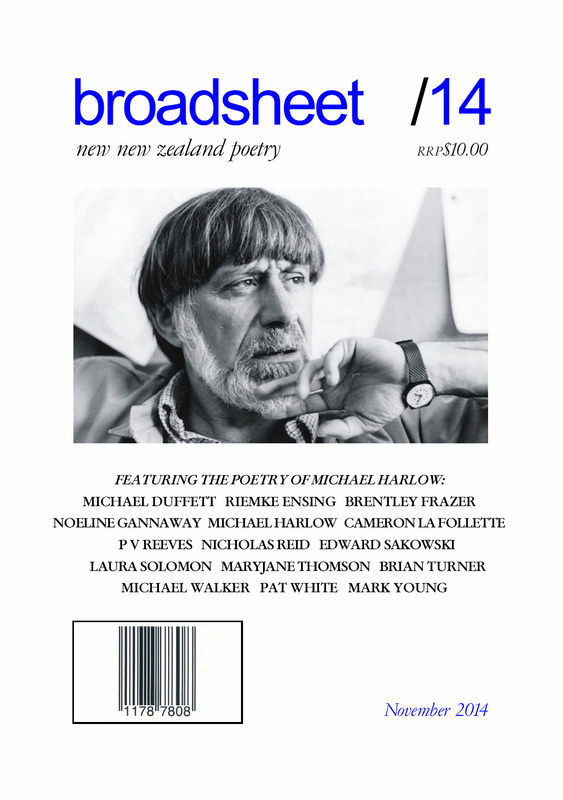 broadsheet 21 features the Australian-based poet and editor Mark Young, who was born in New Zealand in Hokitika. Young is one of New Zealand’s most published contemporary poets overseas and the issue celebrates his contribution to world literature. Poets included are: Tony Beyer, Alan Brunton (1946-2002), Thomas Fink (USA), Michele Leggott, Sheila E Murphy (USA), Michael O’Leary, Lisa Samuels, Pete Spence (Australia), Eileen R Tabios (USA), Mercedes Webb-Pullmann, and Ian Wedde. 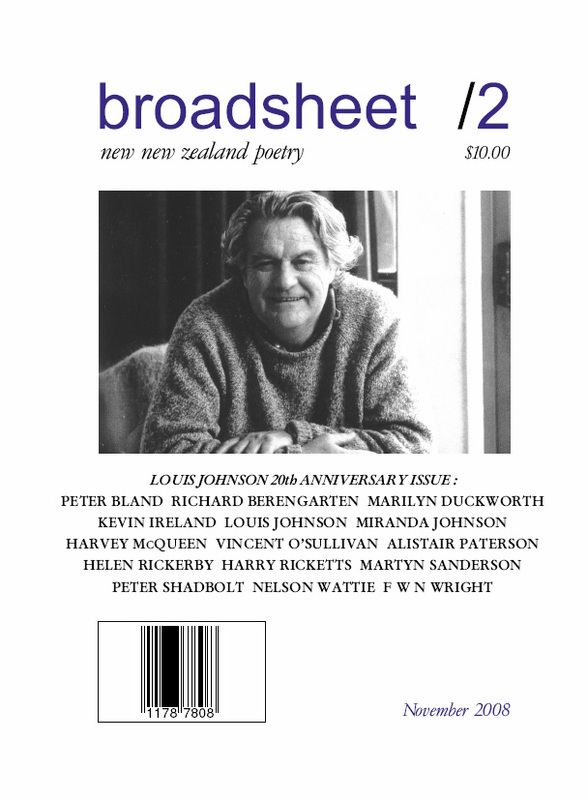 broadsheet 20 features the Australian poet and art critic Ken Bolton, who has had influence on contemporary New Zealand poetry since 1996. The issue celebrates his work and includes poets with a lasting connection with Ken Bolton, both in New Zealand and in Australia. Poets included are: Pam Brown (Australia), Jenny Bornholdt, Laurie Duggan (Australia/UK), Michael Farrell (Australia), John Forbes (Australia), Dinah Hawken, Cath Kenneally (Australia), Gregory O’Brien (Australia), Ella O’Keefe (Australia), Michael O’Leary, Mark Pirie, Dominic Symes (Australia) and Tim Wright (Australia). 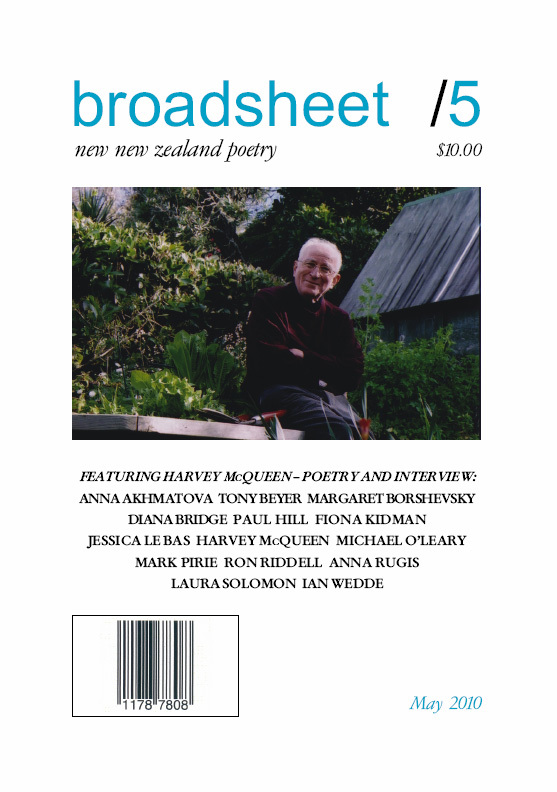 broadsheet 19 features the major New Zealand poet Peter Bland, recipient of the New Zealand Prime Minister’s Award for Poetry in 2011. Others included are: Fleur Adcock, Gordon Challis, Glenn Colquhoun, Marilyn Duckworth, Riemke Ensing, Michael Harlow, Kevin Ireland, Louis Johnson, Kapka Kassabova, Bob Orr, Vincent O’Sullivan, A G Pettet (Australia), Gus Simonovic, Elizabeth Smither, C K Stead. 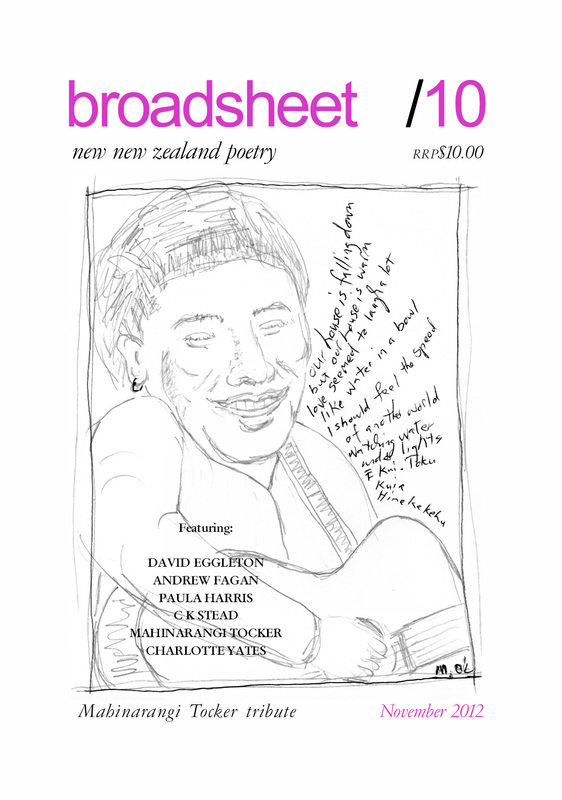 broadsheet, no.18, November 2016, features the Nelson-based poet David Karena-Holmes, author of the selection Genesis (Maungatua Press, 2011) and the long poem From the Antipodes. Others included are: Nick Ascroft, Tony Beyer, Kay McKenzie Cooke, David Eggleton, Brentley Frazer, Rob Hack, Hugh Isdale, Peter Olds, Mark Pirie, Blair Reeve, Richard Reeve, Nicholas Reid, Michael Steven and MaryJane Thomson. broadsheet, no.17, May 2016, features the American-based British poet Michael Duffett, currently Associate Professor of English at San Joaquin Delta College in California. 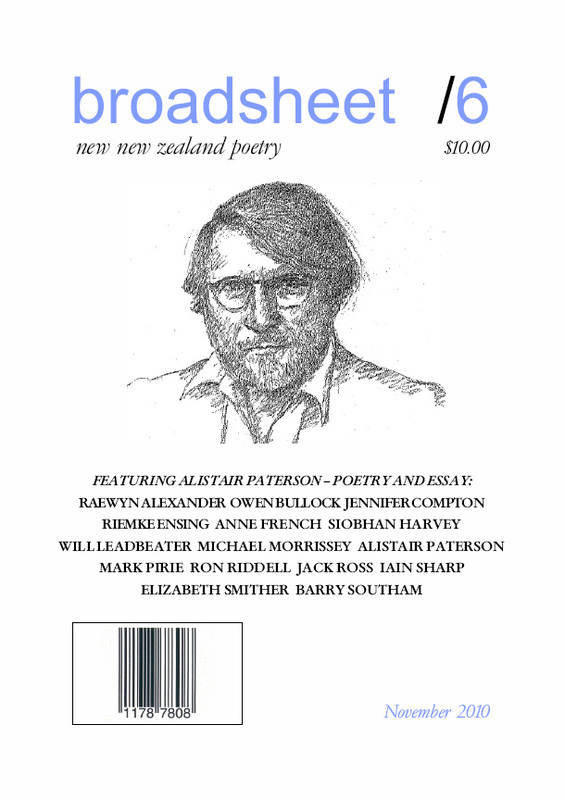 The issue is the first journal to feature his poetry in New Zealand. Others included are: Richard Berengarten (UK), William Direen, Jeanne Bernhardt, Anthony Rudolf (UK), Noeline Gannaway, Richard Reeve, Gary Mutton, Jeremy Roberts, Basim Furat (Sudan), Michael O’Leary, Vaughan Rapatahana, Cameron La Follette (USA), and David P Reiter (Australia). 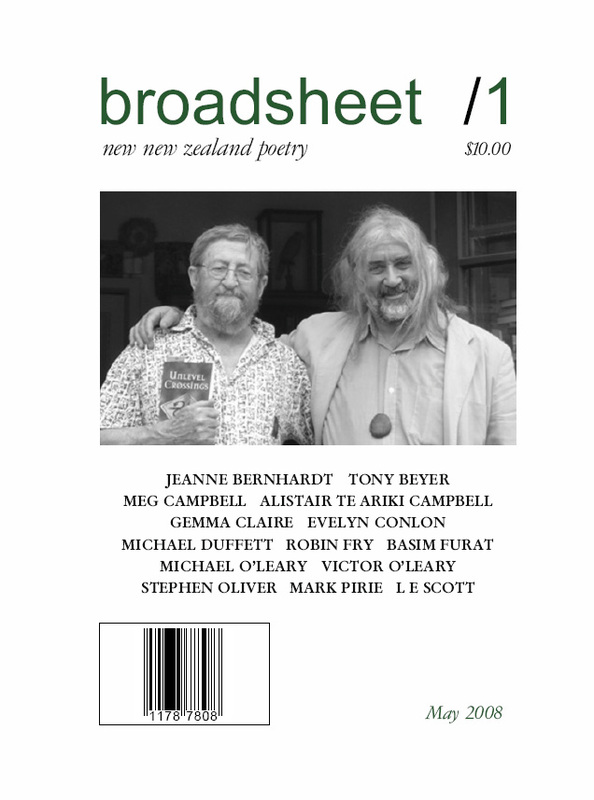 broadsheet, no.16, November 2015, features the Australasian poet Stephen Oliver. The issue is in honour of his significant contribution to transtasman poetry and features a mix of published and unpublished work. Others included are: Pavel Arsenev (Russia), Roger Hickin, Peter Olds, Alistair Paterson, Mark Pirie, Patricia Prime, Nicholas Reid, Laura Solomon, Nicole Sprague (USA), Michael Steven, Bill Sutton and MaryJane Thomson. 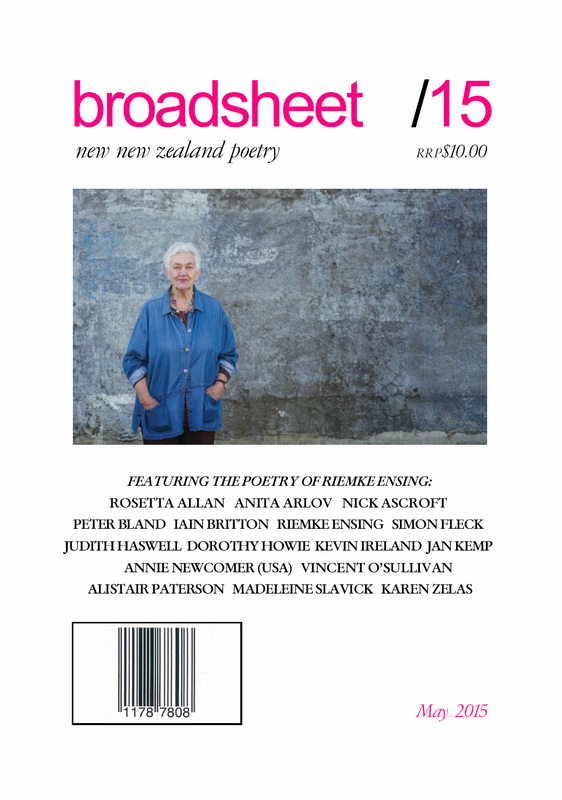 broadsheet, no.15, May 2015, features award-winning New Zealand poet Riemke Ensing. 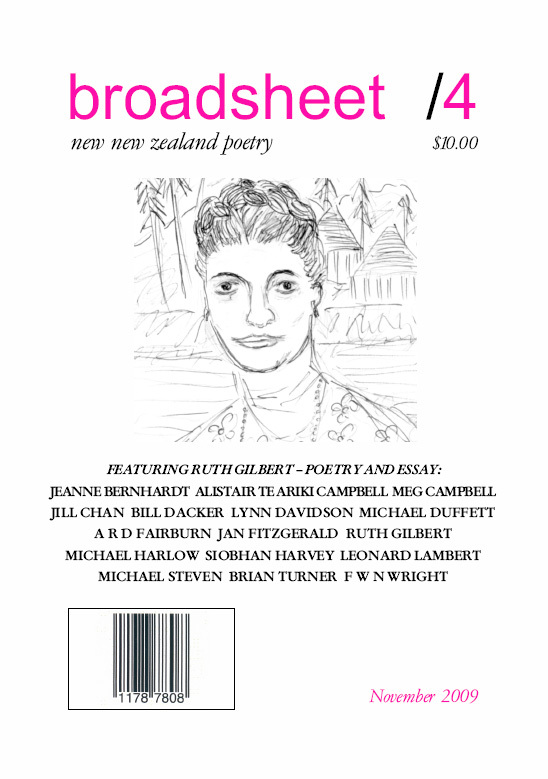 The issue celebrates her significant contribution to New Zealand poetry and features some of her newest, unpublished work. Others included are: Vincent O’Sullivan current Poet Laureate, Rosetta Allan, Nick Ascroft, Anita Arlov, Karen Zelas, Jan Kemp, Judith Haswell, Iain Britton, Dorothy Howie, Annie Newcomer (USA), Kevin Ireland, Simon Fleck, Madeleine Slavick, Alistair Paterson and Peter Bland. The fourteenth issue features the New Zealand poet Michael Harlow. The issue is the first journal to feature his prose poetry in New Zealand. Also included is new work by distinguished UK/US poet Michael Duffett, award-winning poet Brian Turner, P V Reeves, Laura Solomon, MaryJane Thomson, Nicholas Reid, Edward Sakowski (translated from the Polish by Robert Zuch), Riemke Ensing, Noeline Gannaway, Cameron La Follette (USA), Brentley Frazer (Australia), Michael Walker, Pat White and Mark Young. Issue 13 – the football issue features a selection of football poetry from 1890-2014, mostly by New Zealand poets and mainly focusing on New Zealand football but including English and word football. The foreword is by former New Zealand All White Michael Groom (1980-84).Contributors include Simon Boyce, James Brown, Albert Craig (d. 1909, UK), P.S. Cottier, John Dickson, Ben Egerton, David McGill, C.W. Grace (1862-1946), John Gallas, Dylan Groom, Gary Langford, Harvey Molloy, Grant Sullivan, Tim Jones, Michael O’Leary, Bill O’Reilly (1898-1959), Kendrick Smithyman (d. 1995), Harry Ricketts, André Surridge and broadsheet editor Mark Pirie. The issue is published to coincide with the 2014 World Cup in Brazil. 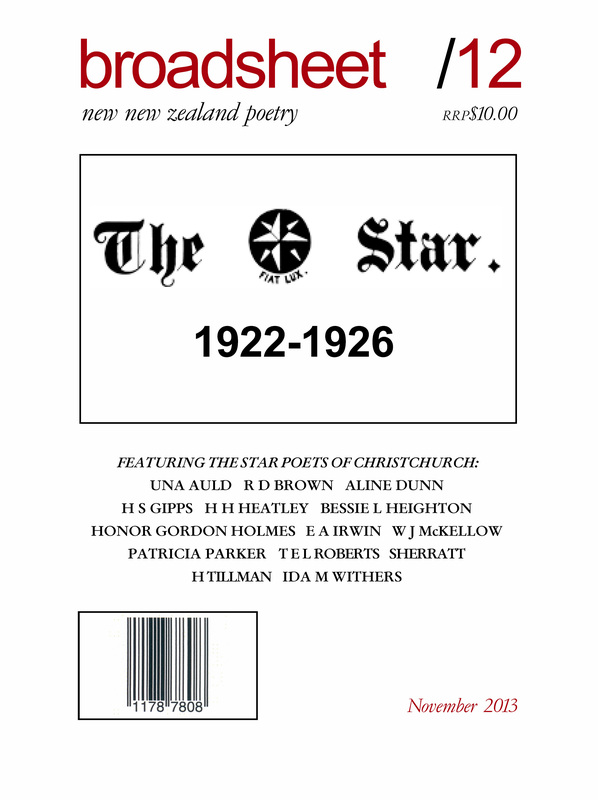 Issue 12 features the Star poets of Christchurch 1922-26, a mostly unknown and previously unacknowledged group of early New Zealand poets. The Star poets included are: Una Auld (nee Currie), R D Brown, Aline Dunn, H S Gipps, H H Heatley, Bessie L Heighton, Honor Gordon Holmes, E A Irwin, W J McKellow, Patricia Parker, T E L Roberts, Sherratt, H Tillman and Ida M Withers. The supplement published with it includes the full index to the poems found in the Star newspaper and the editor Mark Pirie’s field notes to the poets. Updated/new information/errata: Sherratt (full name Alfred Stanley Sherratt) was married to Eleanor. He worked as a Railways clerk/official in Canterbury. The contributor’s note and field notes to broadsheet 12 give his wife as Elizabeth and his occupation as a mill hand. Elizabeth was his mother and his father, also Alfred, was the mill hand. The tenth issue features a tribute to the celebrated singer, songwriter and poet, Mahinarangi Tocker (1955-2008). The issue celebrates Tocker’s contribution to Aotearoa/New Zealand music and poetry. It includes unpublished poetry by Tocker and tributes by her friends Charlotte Yates, C K Stead, Andrew Fagan, Michael O’Leary and Paula Harris. Also included is new work by Tony Chad, Laura Solomon, Jenny Powell, Richard Langston, David Eggleton and Nola Borrell and posthumous or republished work by two poets of New Zealand’s literary past: Robert J Pope (1865-1949) and Ivy Gibbs (1886?-1966). 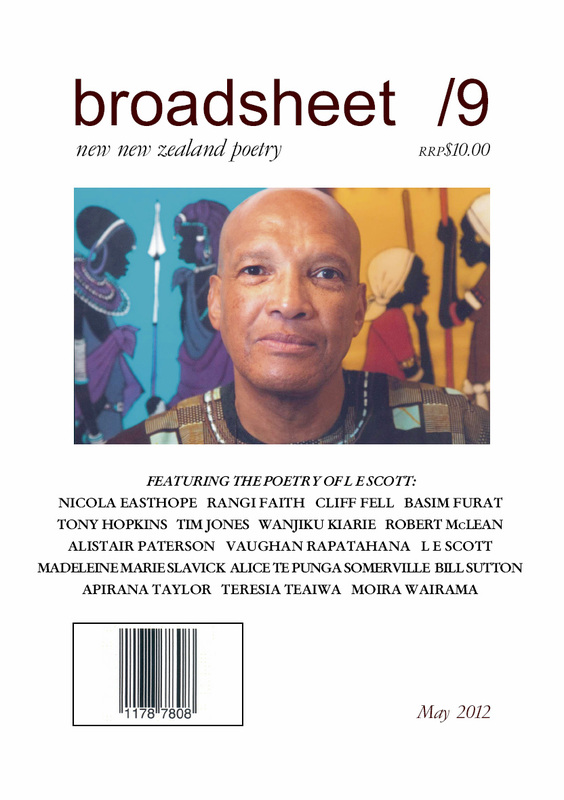 The ninth issue features the New Zealand jazz poet, LE Scott. The issue celebrates Scott’s contribution to New Zealand writing over 30 or more years, and includes an article on the Ballroom Poetry Cafe in Wellington that he founded in 2010. Also included is new work by Nicola Easthope, Rangi Faith, Cliff Fell, Basim Furat (Iraq/NZ), Tony Hopkins, Tim Jones, Wanjiku Kiarie, Robert McLean, Alistair Paterson, Vaughan Rapatahana (Hong Kong/NZ), L E Scott, Madeleine Marie Slavick (USA/Hong Kong/NZ), Alice Te Punga Somerville, Bill Sutton, Apirana Taylor, Teresia Teaiwa and Moira Wairama. 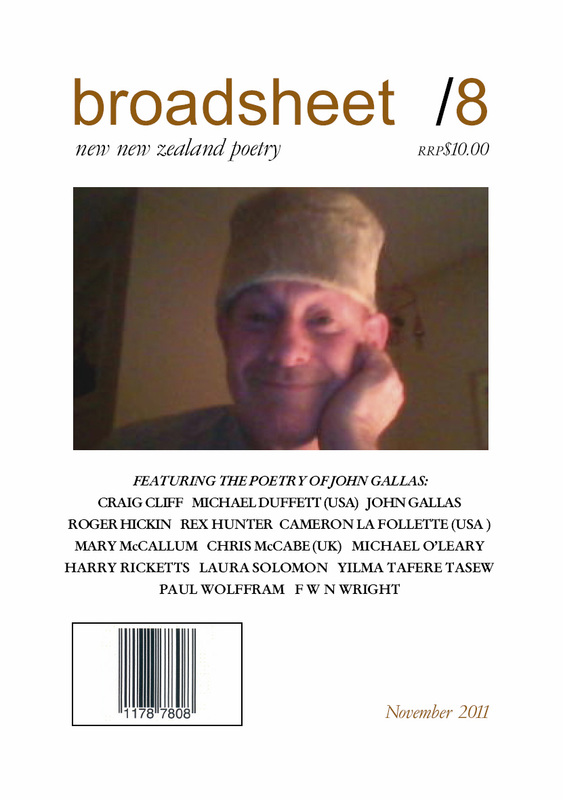 The eighth issue features the UK-basedNew Zealandpoet, John Gallas. Also included is new work by Craig Cliff, Michael Duffett (USA), Roger Hickin, Cameron La Follette (USA), Mary McCallum, Chris McCabe (UK), Michael O’Leary, Harry Ricketts, Laura Solomon, Yilma Tafere Tasew, Paul Wolffram and F W N (Nielsen) Wright. The seventh issue features the British poet/translator, Anthony Rudolf. Also included is new work by Emma Barnes, Sarah Jane Barnett, Janet Charman, Basim Furat (Iraq/New Zealand), Anna Jackson, Jan Kemp, Saradha Koirala, Graham Lindsay, Helen Lowe, Bill Manhire, Genevieve McClean, Harvey Molloy, Ila Selwyn and Madeleine Marie Slavick (USA/Hong Kong). The feature essay is an extract on cricket from Anthony Rudolf’s new memoir. 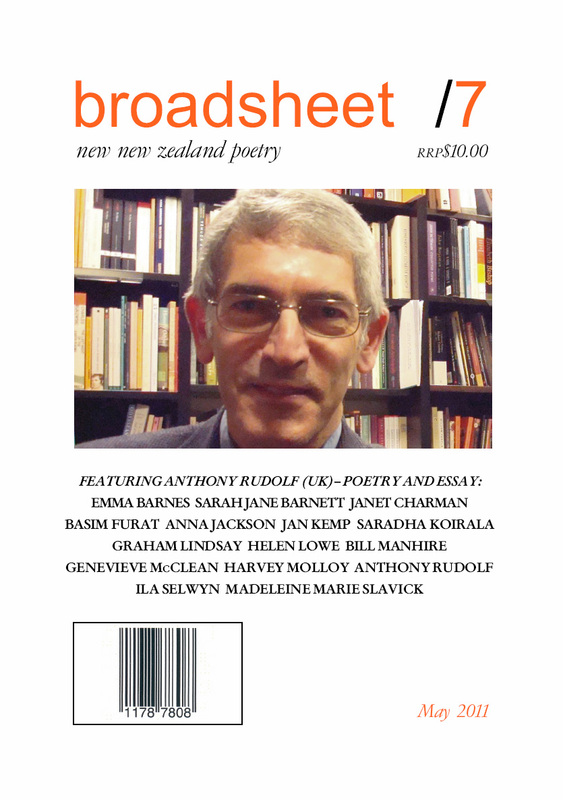 The sixth issue features the well-known editor of Poetry NZ, the Auckland poet/novelist Alistair Paterson. Also included is new work by Anne French, Elizabeth Smither, Barry Southam, Will Leadbeater, Ron Riddell, Iain Sharp, Michael Morrissey, Jennifer Compton, Jack Ross, Owen Bullock, Vivienne Plumb, Raewyn Alexander and Riemke Ensing. The feature essay is by poet/critic Siobhan Harvey on Alistair Paterson’s 1973 collection Birds Flying. The fifth issue features well-known New Zealand anthologist and poet Harvey McQueen. Also included is new work by Ian Wedde, Diana Bridge, Tony Beyer, Ron Riddell, Fiona Kidman, Jessica Le Bas, Laura Solomon, Paul Hill, Michael O’Leary and Anna Rugis. As well as an interview with Harvey McQueen, there are new translations of Anna Akhmatova by Wellington translator Margaret Borshevsky. The fourth issue features distinguished New Zealand poet Ruth Gilbert who has recently received revived interest in her work in Toronto, Canada. Also included is the late Alistair Te Ariki Campbell’s unpublished poem ‘Ode to Wellington City’ along with uncollected poems by Meg Campbell and A R D Fairburn. It includes the following poets: Jeanne Bernhardt, Alistair Te Ariki Campbell, Meg Campbell, Jill Chan, Bill Dacker, Lynn Davidson, Michael Duffett (USA), A R D Fairburn, Jan FitzGerald, Ruth Gilbert, Michael Harlow, Siobhan Harvey, Leonard Lambert, Michael Steven and Brian Turner. Plus F W N Wright looks at Ruth Gilbert’s 1966 collection The Luthier. 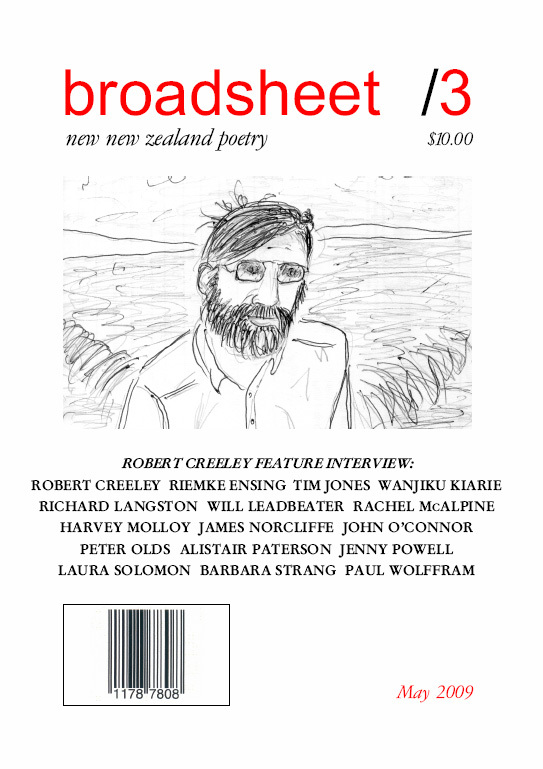 The third issue features an interview with American poet Robert Creeley discussing Allen Curnow and New Zealand poetry of the ’70s/’80s. It includes the following poets: Tim Jones, Harvey Molloy, Paul Wolffram, Barbara Strang, John O’Connor, James Norcliffe, Peter Olds, Rachel McAlpine, Riemke Ensing, Will Leadbeater, Laura Solomon, Jenny Powell, Richard Langston and Kenyan poet, Wanjiku Kiarie. 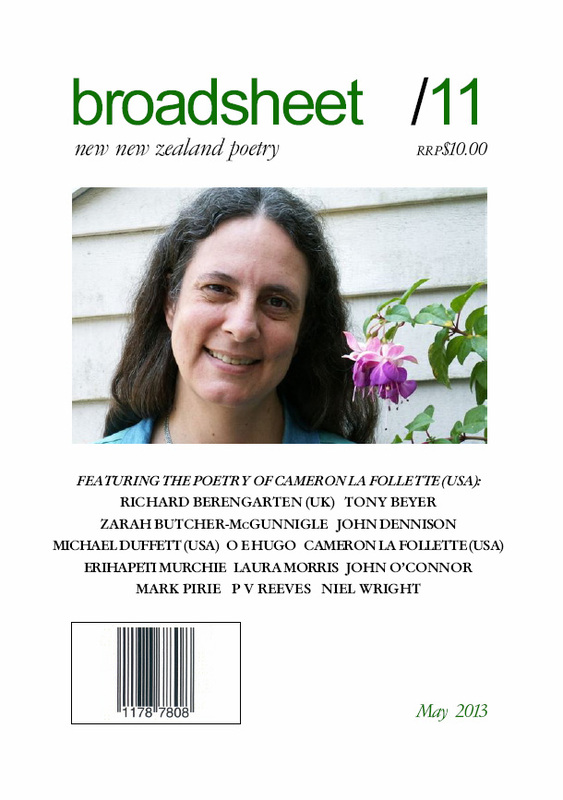 The first issue features the following New Zealand poets: Jeanne Bernhardt, Tony Beyer, Alistair Te Ariki Campbell, Meg Campbell, Gemma Claire, Evelyn Conlon, Robin Fry, Basim Furat (translated from the Arabic), Michael O’Leary, Victor O’Leary, Stephen Oliver, Mark Pirie and L E Scott. 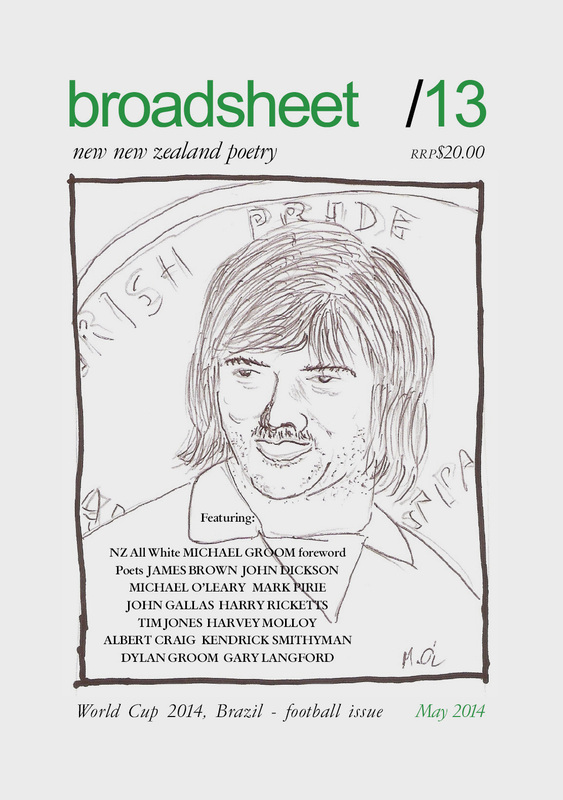 The first issue features Michael Duffett (UK/USA poet/actor) who visited New Zealand in the late 1970s where he met poets Denis Glover, K O Arvidson and Vincent O’Sullivan. Michael Duffett (who once played a part in the TV series Magnum PI) has published his prose and verse extensively. He is currently a Professor of Humanities at Humphreys College, Stockton, CA, USA.